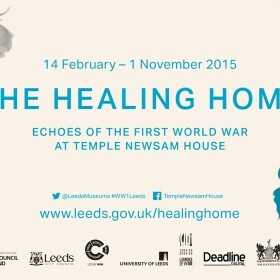 ‘The Healing Home’ exhibition at Temple Newsam has been created to show visitors of the house how the stately home was used as a convalescent hospital during the First World War. 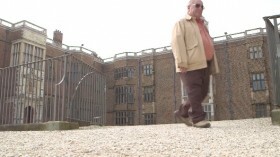 As sponsors of the event, Deadline Digital, created a 15 minute video documentary which explores the impact Temple Newsam had on Belgian soldier, Cyrille Dessager’s family’s life. 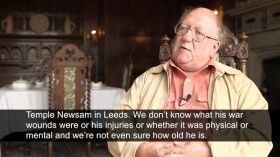 Cyrille’s grandson, Michael Hassell, is the subject of the specially-created video which runs alongside the artefacts helping to build the story of Cyrille Desager. Michael, who supplied the exhibition with handwritten postcards from the solider, tells the story of how his grandparents met, and the consequences of that meeting. The video is currently being played on loop at the exhibition which runs from 14th February to 1st November 2015. Deadline Digital is an outstanding company to work with. I had the pleasure to work with the team on Leeds Museums & Galleries’ most recent exhibition which forms part of the programme of commemorations of the First World War in Leeds. Geoff and his team worked sensitively with the House, its surroundings, with our site staff and most importantly with our subject material. 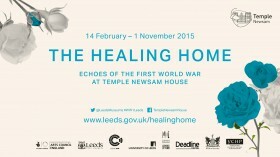 In creating digital content for the Healing Home Deadline Digital responded brilliantly to changes in circumstances, worked flexibly with our house and staff and added a brilliant creative flair to the project. I would undoubtedly recommend working with Deadline Digital to other museums and galleries. The team is enthusiastic, passionate and responsive to the needs of heritage organisations. Geoff and Charlotte are both a pleasure to work with and deliver a great product with care, sensitivity and attention to detail. Work with them – you won’t regret it!